In a rare opportunity to catch his movie “V comme Vian”, French director Philippe Le Guay will be in Cannes for a special event as part of a retrospective of his work. Screenwriter and director Le Guay is known for the movies “The Women on the Sixth Floor”, “Bicycling with Molière” and “Les deux Fragonard”. 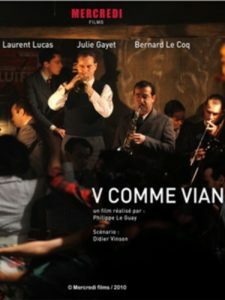 He is the subject of a retrospective of seven of his films, including his 2011 movie about cult French novelist and occasional jazzman Boris Vian, “V comme Vian” starring Julie Gayet and Laurent Lucas. The retrospective runs from September 20-22, 2016 at the Miramar, Licorne and Médiathèque Noailles in Cannes. All details can be found at Cannes-Cinema.